"When the last angel falls, the fight for mankind begins." There have been many movies that have advanced various theories when it comes to the idea of the end of the world, or more precisely, the end of the world as we know it. One such movie that advances a unique aspect would be the 2010 ‘Legion’. This film offers a unique perspective that incorporates a more celestial opinion of the events that can alter the perception of how the world can be changed. Aside from the heavier apocalyptic overtones of ‘Legion’ there are also lessons which can be learned from the film’s plot. Although the movie has plethora of complex characters the premise is centered around a young unwed mother; Charlie, and her unborn child. The beginning of the movie finds Jeep, a young man in love with Charlie, trying to comfort and support her because of her fear and uncertainty of the impending birth. It’s important to understand that Jeep is not the father of Charlie’s baby. The movie is set in a remote desert roadside diner/gas station that is owned and operated by Jeep’s father; Bob. Bob has the help of his war buddy Percy, Jeep and has hired Charlie as a waitress as well as offering her a place to live. The story takes place through the course of a day at the diner that finds a family of three moving to escape the troubles their wild teenage daughter have created as well as a young man who we learn is a single father fighting for custody of his son. As the day progresses a seemingly old lady appears who reveals herself to be some type of demon, bent on the destruction of Charlie’s unborn child. With the appearance of Michael, a renegade angel, has descended from Heaven in order to help Charlie and her unborn child. God has lost faith in man kind and has decided to initiate the Apocalypse by loosing the angels from Heaven. However, the even that precedes the Apocalypse is the death of Charlie’s unborn child, as long as the baby is kept safe the event cannot take place. Realizing this Michael has chosen to descend to Earth in order to help man kind redeem itself in the eyes of God in the hopes of mercy. One of the great aspects of this movie is that it offers something for everyone's taste in movies; romance, action, theology, drama and even a tinge of horror. 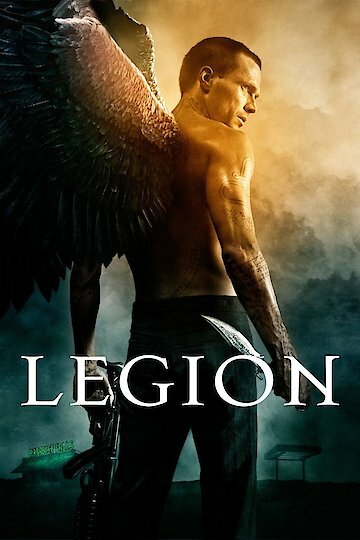 Legion is currently available to watch and stream, download, buy on demand at Netflix, Amazon, Vudu online.